The National Endowment for the Arts announced that Amalia Gladhart will receive an NEA Literature Translation Fellowship of $12,500. Gladhart is one of 22 Literature Translation Fellows for fiscal year 2018. In total, the NEA is recommending $300,000 in grants this round to support the new translation of fiction, creative nonfiction, and poetry from 15 different languages into English. The author of 30 novels, short story collections, and essays, Angélica Gorodischer (b. 1928) is known for her science fiction, fantasy, crime, and feminist writing. She is the recipient of numerous national and international awards, including the World Fantasy Award for Lifetime Achievement previously won by such writers as Ray Bradbury, Ursula K. Le Guin, and Stephen King. Published in 2005, Jaguars’ Tomb is a 218-page novel of 3 distinct parts that addresses the difficulty of representing absence, including those absences left by the abductions and disappearances that occurred during the military dictatorship in Argentina’s “Dirty War” of 1976-83. Each of the sections repeats images from the others and circles a central space that, though it serves different functions in each section, always has a sense of loss at its center. Amalia Gladhart is a translator and professor of Spanish at the University of Oregon and Head of the Department of Romance Languages. She has written widely on contemporary Latin American literature and performance. Her translations include The Potbellied Virgin and Beyond the Islands, both by Alicia Yánez Cossío; and Trafalgar, by Angélica Gorodischer. Her collection of prose poems, Detours, was published by Burnside Review Press. Her short fiction appears in Saranac Review, The Fantasist, Atticus Review, Eleven Eleven, and elsewhere. Delaney Swink, who completed her B.A. with departmental honors in Romance Languages in June 2017, has received the American Translators Association Student Translation Award to support her Spanish-to-English translations of feminist Chilean poet Rosa Alcayaga’s book Maldito Paraíso [Damned Paradise]. Assessing the project, the ATA judges admired Delaney’s “topic, translation style, and the potential for publication.” Besides the award itself, she receives a stipend toward attending its presentation at the ATA Annual Conference in Washington, D.C., in October 2017. Delaney’s project is also supported by the Global Oregon Translation Studies Working Group Undergraduate Translation Award. Together, these will help her travel to Chile for three weeks in January 2018, where she will meet and work directly with Ms. Alcayaga on the project-in-progress. Rosa Alcayaga’s work combines literary and colloquial Spanish, and its cultural allusions range from Biblical-era patriarchs and resistant women heroes to Latin American history and current social-political issues including gender violence. Delaney’s translations render these complex meanings and key contexts in lively English. The project began in Amanda Powell’s translation seminar (RL 407/507) in winter 2017. ¡Felicidades y buena suerte, Delaney! Senior Instructor of Spanish Amanda Powell will be running an 11-day workshop titled “Mundo a Mundo” in Querétaro, Mexico, this July. Mundo a Mundo is a literary translation workshop that has resulted in the exchange of novels, stories, poems, drama and cultural expression – in both Spanish and English. Participants attend three-hour morning sessions, Monday through Friday, for two weeks; afternoons and evenings are free for individual project work and cultural activities, sightseeing and entertainment. Participants include creative writers, journalists, professional translators, cultural activists, passionate amateurs, and university, college and high-school teachers from all over the world. Their ages range from 20-80. While no prior translation experience is necessary, participants are required to be proficient in Spanish and English, as well as have an enthusiasm for literature, language and culture. 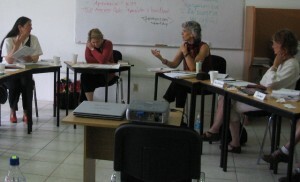 Several UO faculty members, including Amalia Gladhart and Bryan Moore, have attended Mundo a Mundo over the years. 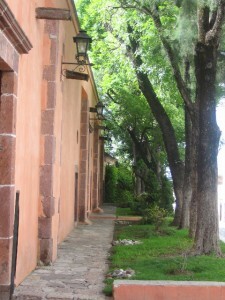 Querétaro serves as the perfect setting for this intercultural workshop as it is a UNESCO World Heritage site filled with romantic plazas, charming colonial buildings and friendly pedestrian walkways. The city balances relaxing cafes, beautiful parks, and Spanish-style patios with dance performances, film festivals and cultural events produced by six major universities, museums, art galleries and shopping centers. 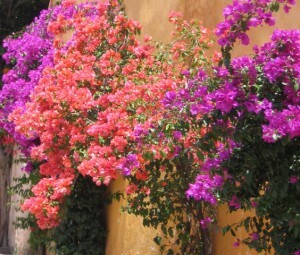 Mexicans and foreigners agree that Querétaro is “muy mexicana.” Workshop participants may choose to live with a host family, or stay in one of Querétaro’s hotels, hostels or bed and breakfasts. Sarah Sullivan is a senior at the University of Oregon. She studies public relations and Spanish.